On our last morning in Laguna beach we stopped by for a quick breakfast at Cafe Zinc, the other breakfast place on Ocean Avenue, right before the more than four-hour drive back to Las Vegas. With three locations in Orange County, this place is loved by the locals and is usually always packed for breakfast. We had been to nearby Cafe Anastasia several times and never to Cafe Zinc as we were initially put off by their no-meat menu (meaning no bacon for breakfast). On our last day though, we decided to try it and see what the fuss was all about. 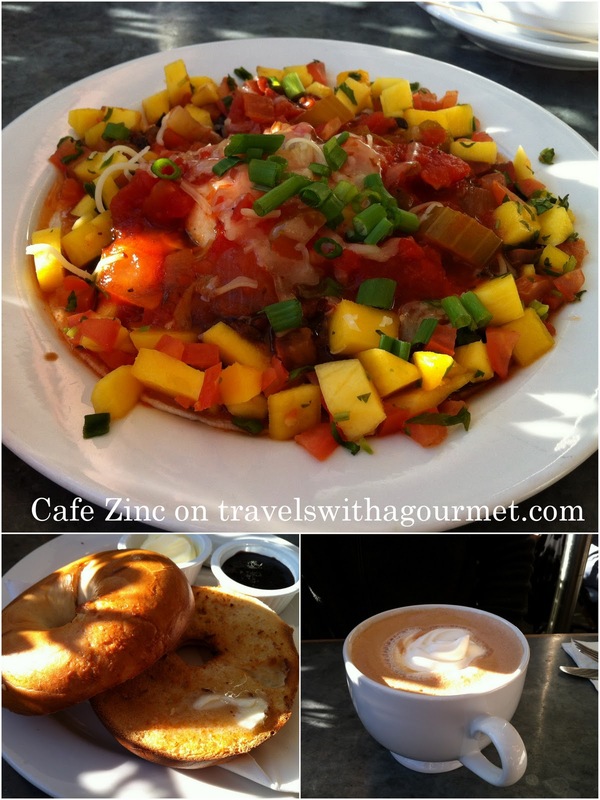 The Laguna Beach Cafe Zinc has both a cafe and market adjacent with a separate entry. The marketplace has a takeaway counter for bread (from La Brea bakery), pastries, coffees and drinks to go plus a large selection of deli items, soups, sandwiches, salads and prepared platters. The Cafe is self-serve and usually has lines snaking out the door so get ready to queue and then try and snag one of the outdoor tables. There is a large breakfast and lunch menu and a dinner menu on the evenings when dinner is served. Although not advertised as a vegetarian place, Cafe Zinc doesn’t serve any meat but there are so many dishes to choose from on their extensive menu that the absence of meat wouldn’t be missed. For breakfast, my sister and I shared the Huevos Rancheros, a poached egg over papaya salsa, blackbean chili, smoked Gouda, marinara sauce and a toasted bagel with butter and jam. She had a creamy cafe mocha and I had a not so great espresso. All in all an okay breakfast but not as tasty as the one at Cafe Anastasia up the road. I would give this vegetarian cafe another chance maybe for lunch when there are more interesting choices on the menu. *Open daily, Market and Cafe from 7 a.m. to 6 p.m.
*Cafe dinners starting May 2, 2012, Wednesday to Sunday from 5:00 to 9:30 p.m.
Hi, Liked coffee information, thanks very much for you input into this website it\’s helpful. I will be back tocheck out your updates and products.